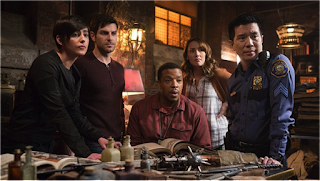 Grimm was full of twists and turns this week, and some major headway on a subplot that’s been interwoven throughout the show since season one. Unlike last week, which seemed like it had 50 plotlines going at once, this week focused on a single one: those mysterious keys with the intricate carvings that we haven’t really talked about in a couple seasons. Nothing makes me more excited than a good old-fashioned treasure hunt full of books, keys, and hidden compartments, so let’s get to it! Our episode opens in Leipzig, Germany with an elderly gentleman who owns an antiquarian bookstore and some ancient texts from the late 1700s that were recently found in the attic of an estate in Prague. 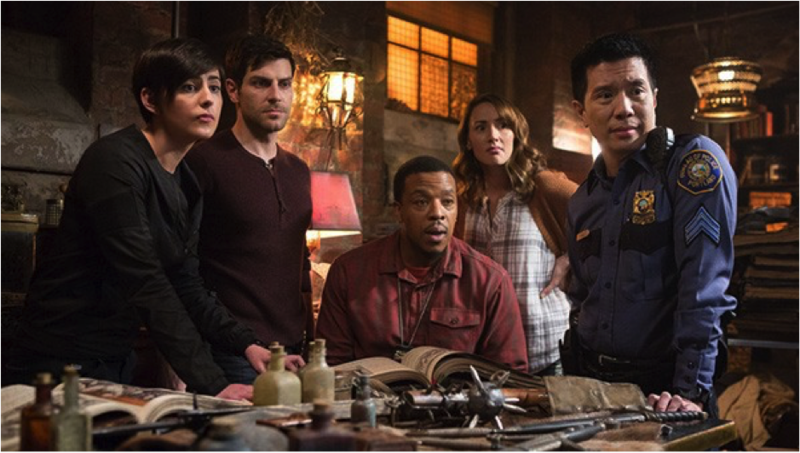 As the gentleman looks over the texts with the antiques dealer, a woman with a terribly unbelievable accent, it’s clear that these are Grimm books, similar to the ones in Nick’s possession. The gentleman makes it out of there with the trunk full of books just in time, for a few hours later a couple of creepy Wesen arrive at the estate and murder the antiques dealer, probably due more to her terrible accent than the missing books. It’s revealed that the gentleman is Monroe’s Uncle Felix (the Wesen/Grimm world sure is small). Uncle Felix calls Monroe to tell him about the Grimm books and inquire as to whether Monroe’s Grimm friend would like to have them. And if you’re wondering how Monroe’s uncle from the other side of the world knows about Nick, apparently Monroe’s mother can’t keep a secret. Thankfully, Uncle Felix is pretty savvy. Shortly after he calls, he hops on a plane bound for Portland, and takes all of the books with him. Good thing too, because his bookstore is completely destroyed by the men who killed his Prague associate. Uncle Felix didn’t become a successful antiquarian bookstore owner without the ability to drive a hard bargain. And so, he attaches a $100,000 price tag to the 20 books in his possession. Apparently being a Grimm doesn’t pay that well (or at all) because Nick says he can’t pull together that kind of money. Nick and Monroe pay a visit to Meisner at the Hadrian’s Wall compound to ask if he can cover the cost of the books. Meisner is non-committal about the money but does reveal an important piece of information: the men who killed the antiques dealer and who are currently hunting Felix are members of Black Claw (of course). 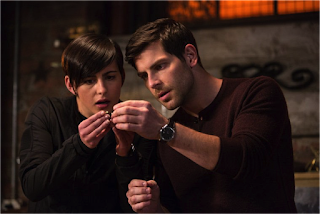 Trubel makes some comment about how Black Claw’s goal is to destroy everything Grimm-related, which is probably why they’re after the books. She says it so nonchalantly, but I’m pretty sure that’s the first time we’ve actually heard this part of Black Claw’s mission. Turns out poor Uncle Felix isn’t long for this world because Black Claw tracks him to his hotel room and murders him. I guess the team doesn’t have to worry about trying to find that $100,000 after all. Meanwhile, Rosalee uses her mad research skills to discover that the owner of the books was a descendent of a Templar Knight, who was most likely a Grimm. This officially makes these the most ancient Grimm texts the team has ever encountered. In what seems like a violation of several police protocols, Nick and Hank take Monroe to his uncle’s crime scene. Uncle Felix took a pretty significant bite out of his killer, which as Monroe points out, means the man is injured. I feel like at this point, Monroe should have whipped out his Blutbad skills and used the scent trail from the man’s blood to track him down. But alas, that idea doesn’t even come up and they just use old fashioned regular policing to look for the men. I think sometimes the Grimm writers forget the skills they’ve given Monroe in the past. The race is on as the two Black Claw Wesen responsible for Uncle Felix’s murder track the books to a warehouse. Fortunately, Nick and Monroe aren’t far behind. Monroe is out for blood and gruesomely kills one of the Wesen while Nick takes out the other in a more controlled fashion. No one will be missing these guys, except their Black Claw associates. The team gets the trunk, and didn’t even have to pay any money for it, so that seems like a win-win. The trunk has as many secrets as the books it holds. There is a false bottom to the trunk that holds a variety of weapons that I’m sure Nick will find handy in the coming days. The books contain the lineage of all of the Grimm families out there, and has been kept up-to-date over the years. Nick’s name is in there, but we don’t have time to find out if Trubel or her family are in there because while the rest of the team has been pouring over the books, Monroe was busy analyzing the trunk itself. After some investigating, Monroe discovers another hidden compartment within the trunk, beneath the oversized lock. This smaller hidden compartment holds a package containing three more of the mysterious keys that Nick has been sort-of searching for since season one. Nick and team already have two keys, so with the addition of these three they are now up to five. We learned in previous seasons that there are seven total. We also learned the intricate carvings on the keys reveal pieces of a map, and now that map is almost complete. The team at least have enough of the map revealed now to realize it’s the Black Forest. Apparently, Nick’s adventures as a Grimm will finally take him out of Portland. Eve can apparently do handless pushups, which would be impressive except I’m pretty sure it defeats the purpose of pushups. Despite the fact that these books are from the 1700s and Felix insists on using gloves to handle the books, Monroe, Rosalee and Nick start pawing at them with gloveless hands the minute he’s out of sight.